Attention all chocolate lovers! Did you know there is a whole week dedicated to celebrating your favorite treat? March 15 – 21 is American Chocolate Week. If you’ve ever needed an extra excuse to indulge in your favorite chocolate goodies from Hawaii’s Local Buzz, this is it. High-quality chocolate is smooth, flavorful and utterly satisfying. 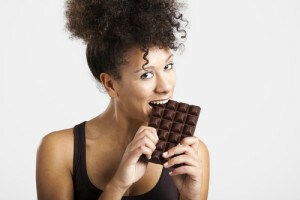 Research shows that eating dark chocolate from time to time may even be good for your teeth, so you don’t have to feel guilty for indulging during American Chocolate Week. Our chocolate treats from Hawaii will satisfy your cravings, and since they’re made with the highest quality smooth and delicious Guittard chocolate, every bite is like stepping into a dream. Coffee aficionados always enjoy our Coffee Bean Crunch. Made with our 100% Hawaiian Ka’u coffee, this gourmet treat comes in three flavors: dark chocolate vanilla, milk chocolate caramel, and white chocolate cinnamon bun. We use vanilla-infused sea salt, with real bits of vanilla, to flavor the crunch, adding remarkable richness to this flavorful treat. Another one of our well-known chocolate treats from Hawaii is our Chocolate Macadamia Nut Bark. We envelope our own carefully grown macadamia nuts in rich, Guittard chocolate, resulting in a snack that has a delightful combination of crunch and smoothness. For a delicious chocolate snack with extra crunch, try our Chocolate Covered Macadamia Nuts. Each nut is covered in a thick, indulgent layer of chocolate. Dark, milk and white chocolate-covered nuts are available, and we also offer Ebony & Ivory nuts, which are coated with a combination of dark and white chocolate. Pack one of our chocolate treats in your lunch, enjoy it as an after-work pick me up, or even add some chocolate to your breakfast if you like. Visit Hawaii’s Local Buzz to discover the best American Chocolate Week indulgences, along with other delicious Hawaiian treats.